Geek Lit Etc. : Manga Monday: How far will a young scholar go to win the hand of the maiden? Manga Monday: How far will a young scholar go to win the hand of the maiden? 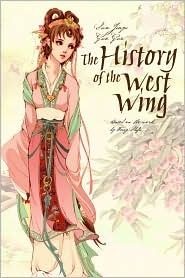 A beautiful girl, living in a monastery with her mother and maid, spies a travelling scholar in the orchard in the manga based on a classical Chinese play, The History of the West Wing. Pianpian, the beautiful daughter of a government minister, has been promised since she was young to the son of imperial secretary Du Heng. Being the obedient daught er she is, she seems content in this, spending most of her days embroidering or making stationery. She also takes the occasional walk through the monastery's courtyards with her maid Hong Niang, which is where all the trouble starts. Being a small village, without much to keep the young men busy, they've all heard of the young maiden who lives in the monastery. It's even become something of a hobby for them to try to catch glimpses of Pianpian over the wall as she reads in her rooms or walks around the grounds. And when Chen Yuqing, a wandering scholar, arrives in the village, the men are quick to tell him about her, and invite him along on their daily viewing sessions. But fate would have it work out another way, and the two both meet face-to-face and fall in love. Now, Yuquing has to find a way to earn the respect of Pianpian's mother to gain her hand in marriage. Most of the manga-style work that makes it to the US is from Japan. There, they have an abundance of folklore and traditional stories, from Dororo to Natsume's Book of Friends to draw from. Sun Jiayo and Guo Guo, both from China, do a beautiful job with The History of the West Wing, using their Chinese traditional stories and evoking both the delicacy of the sheltered noble girls of the era, as well as the way in which women are at the mercy of the men in their lives, be it fathers, husbands or their betrothed. Yen Press did a fantastic job with the North American release of this book, keeping a slightly larger format than most manga, and printing in color as well. Large frames, as well as full-panel scenes at the back of the book show a masterful use of watercolor techniques, as well as attention to both the composition of the frame as a whole, and the details such as the drape of fabric or the twist of hair. Certainly one of the more pretty manga to be released by Yen Press, and one that can be enjoyed many times over. Highs: As the forward informs us, Hong Niang has been immortalized in Chinese language as part of the term for 'matchmaker,' and her deviousness here is reminiscent of many an interfering character in fiction. Lows: It must be a bit hard to translate a play into a manga, and a few of the transitions between acts were hard to follow. Verdict: A beautiful, delicate story that makes me wonder what else ought to be brought over from Mainland China to Western audiences.